The gist: Research on healthy relationships shows if you want stronger, long-lasting connections, you have to develop the right mindset. Anne was a struggling actor in New York. Trying to get her foot in the door somewhere—anywhere—she set out to hire an agent. A few calls later and she was sitting down for an interview. Things seemed to be going well. Maybe too well. After a few questions, Anne realized she’d come across town for nothing. The agent didn’t want to find her work—he wanted to date her. She left the office crying, wondering why she couldn’t get the respect she deserved in her career. That’s when she met Jerry, another struggling actor who happened to be sitting in the waiting room of that same office. Jerry consoled her a moment, they chatted, and decided to go for coffee. The story of their meeting is fun, but the rest of their tale is far more meaningful. When Meara passed away, they’d been married 60 years. That’s an incredible accomplishment for any couple, but nearly unheard of in the land of fame and fortune. What was the glue that held their marriage together as they crossed the minefield of failed relationships that seem to litter the landscape of the rich and famous? Jerry and Meara’s “relationship theory”—the way they thought about their marriage and how it should work—gave them a distinct advantage that kept them happy all those years. It’s almost impossible to grow up without adopting some sort of idea about how relationships should work. We see how the people around us start, maintain, and end their relationships. All these inputs come together to form our opinions about what does and doesn’t work. What should and what shouldn’t happen over the course of a successful partnership. Despite all the possible variations, many psychological studies have found they all fit into two categories. Researchers call them implicit theories of relationships, and the one you end up with has a lot to do with how long and satisfying your relationships are. Do you think relationships either work or they don’t? When you meet someone, do you immediately see sparks flying or feel a dull sensation in your chest? If that sounds like you, you might lean towards the “destiny” end of the relationship theory spectrum. When you think this way, your guiding belief is that two people are either compatible or they aren’t. Whatever you do along the way won’t change that. If you’re incompatible, the good times will only delay the eventual breakup. But, when they don’t—when things start slow or rocky—they’re ill equipped to work through the kinks, thinking instead the relationship was doomed from the start. Even more, the destiny theory keeps you from seeing your own contributions to relationship failures. Why analyze when the stars simply weren’t aligned? On the other end of the spectrum lives the growth belief—the idea that strong relationships are cultivated over time and require work to make them great. Jerry and Meara fall directly into this category. There is a lot of strength in staying together. You can probably think of plenty of cases where two people stuck together when they shouldn’t have. You can probably also think of plenty of cases where two people split over a difference that seemed like it could have been overcome. It’s these cases where two people who believe in the hard work of a marriage can set themselves up for long-term success. When you believe relationships take work, you’re more willing to accept what others might see as incompatibilities as opportunities to grow and learn with your partner instead. You’re not repulsed by the bad habits that show up after a few months or the annoying mannerisms you didn’t notice at first. Instead, you see them as bumps in the road—not ideal, but not deal breakers, either. 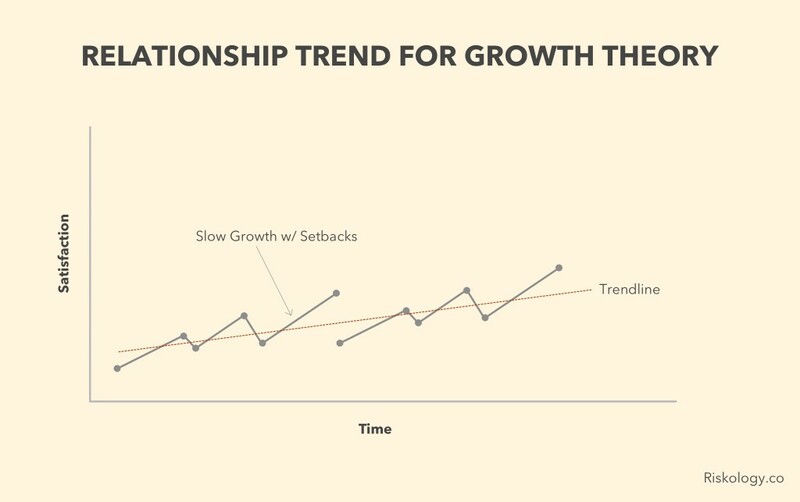 The growth belief helps you build deeper connections because you stick with it long enough to overcome big hurdles. And successfully navigating those challenges together builds trust and connection that grows as time goes on. It’s a slower, more moderate path, and it doesn’t look like what you’re used to seeing on TV. But, if you get past that, the opportunity for long-term success increases. If you read this and realized you fall closer to the destiny end of the spectrum, don’t worry. You’re not doomed to roller coaster relationships (that’s just your destiny belief talking). What it means, though, is you have some work to do. And the more effort you put in, the more you and the people in your life will benefit. Don’t get blindsided by new relationships that start great. One reason people with destiny beliefs struggle is because they’re susceptible to falling in love quickly and attribute the relationship to things outside their control. When something goes wrong, though, it feels like there’s nothing you can do to fix it. Face your disagreements head on. A key finding of the research cited earlier is that the growth-minded work to solve the problems in their relationships while the destiny-minded avoid them. No relationship comes without bumpy patches. If you want yours to last, your odds improve if you learn to solve your problems together. Consider your own role in problems that arise. 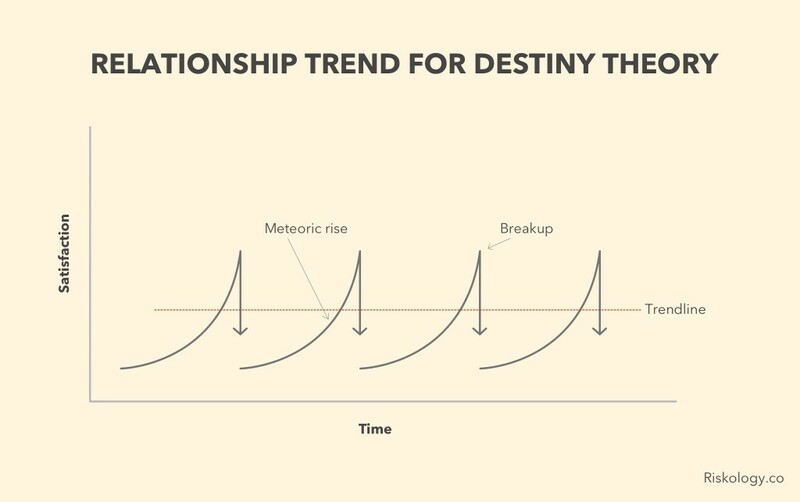 When the destiny-minded breakup, you’re less likely to consider your contribution to the downfall because it feels like the breakup was supposed to happen. But the growth-minded look inward, and that quest for improvement carries over to each new relationship. You can’t change your relationship theory overnight. In fact, you’ll work on it the rest of your life. But when you care about growing and improving, that won’t seem like an obstacle you can’t overcome.